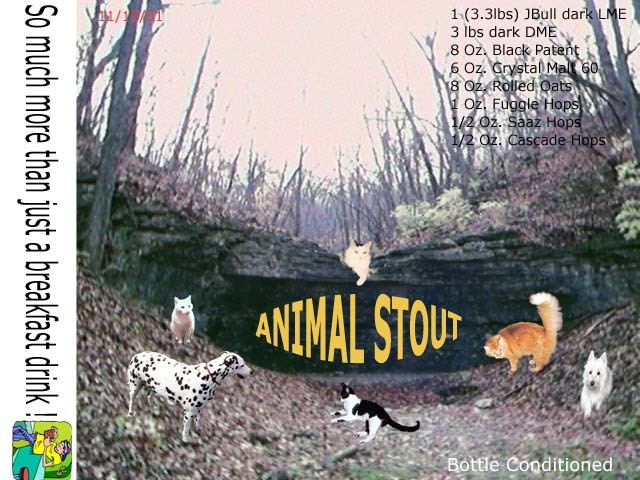 This is Animal Stout, a simple easy to make Oatmeal Stout. I originally made this beer from left over malt and hops, no better use for left overs has ever been found. Directions: Steep speciality grains in 2.5 gallons of water at 160° F for 15 Minutes. Remove grains and add the malt extract, bittering hops, boil for 30 minutes. During Last 10 minutes add Irish Moss and Finishing Hops. Add water to get to 5.25 gallons of wort, cool and transfer to fermenting vessel with yeast. Transfer to a secondary fermenter, wait, Bottle and Enjoy.